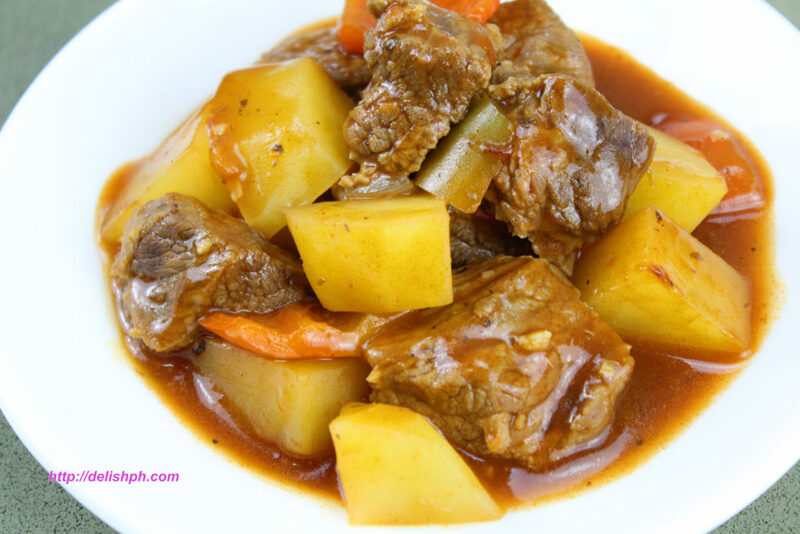 Mechado is one of the most popular Filipino recipes. Just like any other dish, it has different versions. 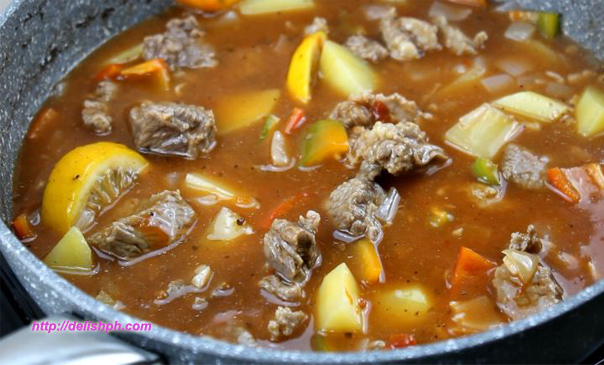 This Beef Mechado “Delish Ph” style is very easy to prepare and it doesn’t require too many ingredients. If you want to make your family eating moment special, this is your must-try dish. 1. Heat pan with little oil, saute white onions and garlic. 2. Add in beef cubes. 3. Pour in water. Cover for about 45 minutes, or until the meat becomes tender. 4. Add in the potatoes. Cover for about 5 minutes. 5. Add in the bell peppers and slices of lemon. 6. Then add the tomato sauce next. 7. Season with salt and pepper. Simmer for another 3 minutes. 8. Pour in the soy sauce. 9. Let simmer for another 5 minutes. I’ve seen several versions of Mechado everywhere. This one I made simple and easy. You can also add bay leaves to add more flavor. But for me the taste of lemon makes this dish yummy and tasty. To cook it even faster, you can use a pressure cooker. Or you need to boil the beef for about 45 minutes to an hour. If you have questions about this recipe, don’t hesitate to drop me a message or submit a comment below. I will get back to them as soon as I can.